I didn't go to this year's Rolex 24 Hours at Daytona because of continuing work on two books with my publisher and editor Joe Freeman at Racemaker Press. The first of these is our epic history of Carl Haas Auto and Newman/Haas Racing which we have worked on for many years. We're deeply immersed in the photo edit and caption writing and hope to publish the book later this year. The other is my biography of Wally Dallenbach, a true racer and gentleman and by most estimations the best chief steward in the history of Indy car racing. Working on these books is a great pleasure and while watching the Rolex 24 on TV I have to say I was happy to be working in Boston with Joe ran than enduring the rain and cold weather at Daytona. This year's Rolex 24 was a good start for IMSA's new DPi formula with a dozen prototypes at the sharp end of the field, which was dominated by a trio of new Cadillac DPis. And of course, a tremendously competitive field of GT Le Mans cars put on a fine show with less than eight seconds covering the first seven GTLM finishers after 24 hours. As everyone knows, the race was decided in the closing minutes by Ricky Taylor's bump and run assault on Felipe Albuquerque. Taylor's move will go down as a minor but classic moment in Daytona and IMSA's history. It was no surprise that IMSA failed to penalize Taylor, enabling the Taylor family to break a long string of second places and for the retiring Max Angelelli and unretired Jeff Gordon to stand atop the victory podium. The new Cadillac DPis showed they will be the cars to beat this year. The big question is can Taylor's team, without Angelelli or Gordon, outpoint the pair of Mustang Sampling/Whelen Engineering cars. Gary Nelson's team has demonstrated first-rate reliability and championship-winning capability over the past few years establishing itself as IMSA's gold standard. 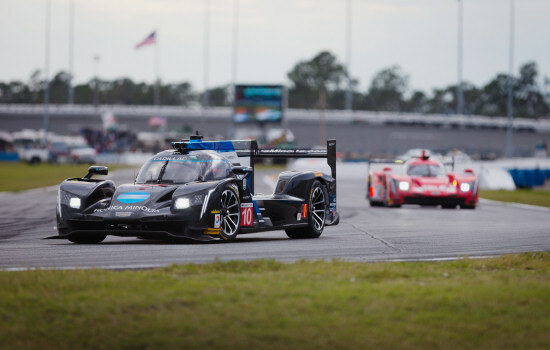 Defending IMSA champions Dane Cameron and Eric Curran ran into some trouble at Daytona but still made it home fourteenth overall and fifth in the DPi category. Nevertheless, if they are to beat teammates Joao Barbosa and Christian Fittipaldi over the course of the season Cameron and Curran must run faultlessly in most every race. Much was expected of the pair of Extreme Speed Nissan DPis, winners of last year's Rolex 24 Hours and Sebring 12 Hours with a Nissan P2 car. The team returns to IMSA full-time this year after two seasons racing primarily in the WEC. Extreme Speed's new Nissans were driven at Daytona by Scott Sharp/Ryan Dalziel/Luis Felipe Derani and Ed Brown/Johannes van Overbeek/Bruno Senna with Sharp/Dalziel/Derani finishing fourth overall. ESM will keep the pressure on the Cadillacs and may win some races. Mazda is also fielding a pair of new DPi cars this year. The Mazdas ran well at Daytona but neither car finished the race. The big challenge for IMSA is building a larger field of strong DPi cars. This will be the last season for Oreca's Prototype Challenge cars and it's hoped that some of these teams will move up to the DPi category next year. The Daytona field was rounded-out by five Prototype Challenge cars, eleven GT Le Mans cars and 27 GT Daytona entries. Nine different marques were included among the GT Daytona entries with new cars from Acura, Lexus and Mercedes-Benz making their debuts at Daytona. In many ways the GT Le Mans category is IMSA's primary attraction with factory-backed teams from Ford, Corvette, Porsche, BMW and Ferrari. These teams and cars put on a great show at Daytona with Dirk Mueller/Joey Hand/Sebastien Bourdais winning the class for Chip Ganassi's team and Ford making the point that Ganassi's Fords will once again be very hard to beat this year. The successful arrival of Ford's new GT has pushed Porsche to produce a new 911 RSR for this year while Risi Competizione's latest Ferrari 488GTE was very strong at Daytona, battling hard for the lead all the way. It will be interesting to see how Corvette Racing and BMW respond over the course of the year to the new cars from Ford, Porsche and Ferrari. IMSA's greatest strength without doubt is its powerful collection of manufacturers who love to race cars with roofs and headlights that look something like their road cars. The manufacturers provide most of the money for many IMSA teams and drivers. They also promote not only their own cars but the sport as a whole and are a key element in insuring IMSA's continued success. It also has to be said that IMSA is doing a good job with their Balance of Performance equations. I'm an old school guy who hates the concept of 'BoP' which will forever be a contentious matter. 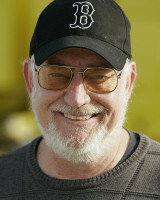 But I've accepted that 'BoP' is essential to making close, competitive racing, which is what everyone wants these days. Another of IMSA's strengths is that it enjoys a great selection of venues including Daytona, Sebring, Long Beach, Laguna Seca, Lime Rock, Mosport, Elkhart Lake and Road Atlanta. These are among North America's oldest, most respected road courses and provide IMSA with a solid schedule of quality races and crowds. 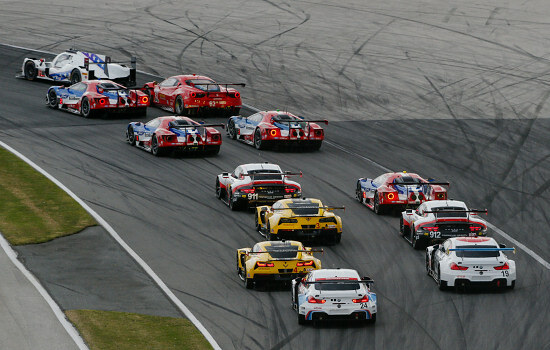 Like every other form of racing, IMSA struggles to pull good TV ratings. Daytona was up slightly over last year but the numbers continue to languish like IndyCar well behind most major league sports. One thing IMSA's TV show enjoys are some good commentators in Calvin Fish, Tommy Kendall and Brian Till. Accomplished former racers, these guys do their homework and know their subject well. It's doubtful if IMSA will ever regain the glory days of GTP racing thirty years ago with the latest and greatest prototype sports cars equal to those competing at Le Mans but IMSA has established itself as the epicenter for North American sports car racing. Together with a strong card of support and ladder series IMSA's future at the helm of American sports car racing is assured.